Catalina Yachts has found a formula for success: provide a well-built, moderate-performance yacht for the coastal cruiser with high-quality gear and a modern interior, at a minimum price. It doesn't sound like much to ask, but Catalina has blossomed into the world's largest builder of fiberglass yachts on the concept. The 320 is no exception to its rule, although they have pushed the envelope in both performance and accommodations, a surprise since the two attributes usually trade off against each other. 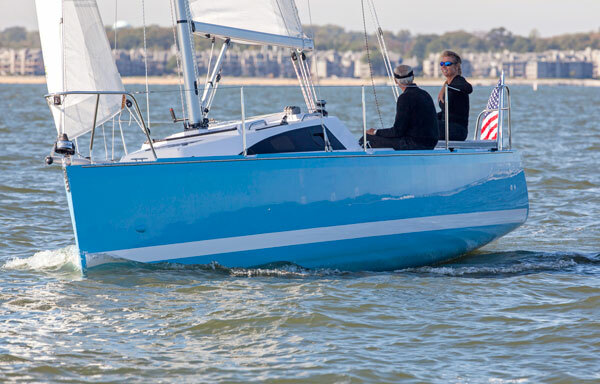 Designer Gerry Douglas produced a high-performance hull with a relatively shallow but beamy canoe body, a choice of either fin or winged keels, and a tall rig with an I dimension of nearly 44 feet. Certainly the most notable feature of the 320 is how far aft the beam is carried, gaining immense volume belowdecks as well as a spacious cockpit and good design stability. 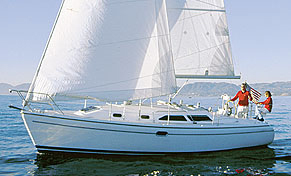 Construction on Catalina boats is a refined science, with a solid fiberglass hull, balsa-cored deck for stiffness and light weight, and the extensive use of molded interior liners. It is a time-tested method, and the company has built literally thousands of boats in the same way. A five-year warranty covers both hull structure and blisters. Because of the beam, the T-shaped cockpit is quite large for a boat of this size, and the seats are ergonomically designed for comfortable back support. The helm seat lifts out and the stern pulpit folds down to become a swim step, while two additional seats are built into the corners of the stern pulpit. The beam allows wide side decks, and inboard chainplates provide more room (and closer sheeting angles). There is an oversized anchor locker forward which, on our test boat, hid the optional anchor windlass. 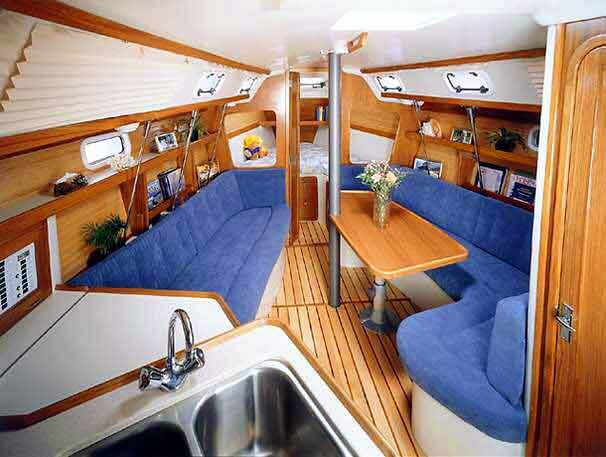 Belowdecks, Douglas came up with an innovative and comfortable interior. The forward bulkhead has opening teak panels, allowing privacy in the V-berths and an airiness to the entire cabin. The curved settee converts to a double berth using the adjustable table, and the navigation table (with electronics panel) uses the other settee as a seat. The aft galley is exceptionally well-equipped, with a 5.8-cubic-foot DC Adler-Barbour refrigerator, Corian counter tops, two-burner HilleRange stove with oven, hot and cold pressurized water, and lots of storage space. The one-piece molded head compartment near the companionway is bright and easily cleaned, and the pressure shower is also standard. Certainly the most startling feature of the 320 is the aft stateroom which, unlike most under-cockpit cabins, actually has standing headroom. The oversized double berth is extra long, and there is light and air from five ports plus a translucent panel behind the galley. The result is a truly livable aft cabin in a 32-foot boat. Power is a three-cylinder, 29-horsepower Yanmar diesel, with freshwater cooling and a two-bladed prop. Our test boat had the optional solar battery charger that mounts flush in the seahood of the main hatch to provide a continuous trickle charge. 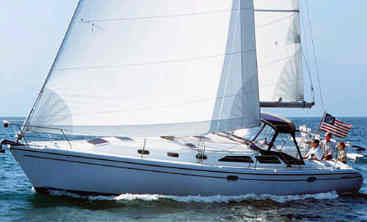 Under sail, our 320 performed impeccably. 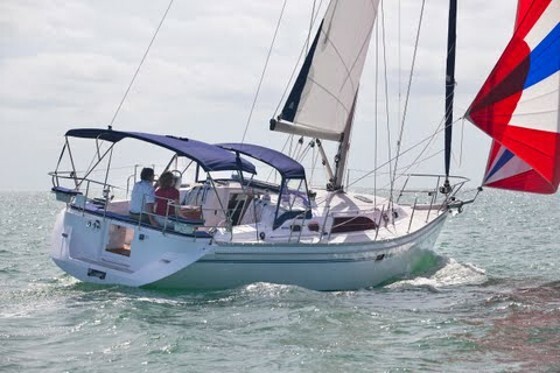 The asymmetric rudder provided plenty of control, and the double-spreader mast carried the full battened main (with standard Dutchman flaking system) and 135 percent headsail (on Hood furling gear) without tenderness in 18 knots of true wind. 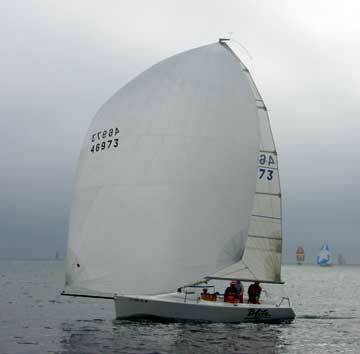 Nimble and lively, she was a delight to sail and we didn't want to bring her back. 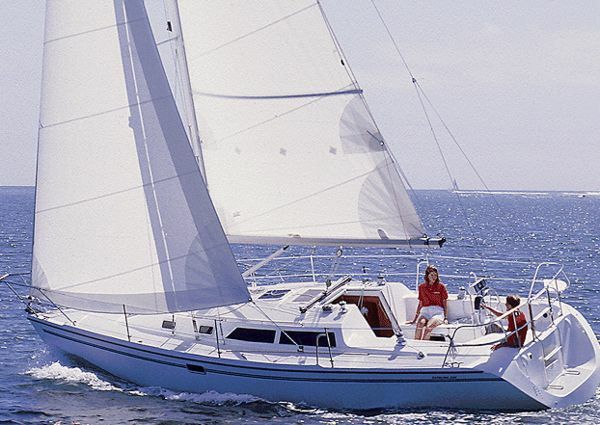 With the long list of standard gear (sails, diesel, refrigeration, stove, pressurized hot water, roller furling, Edson pedestal steering, shore power, double lifelines), the Catalina 320 is a must-see for anyone considering a boat under 35 feet. 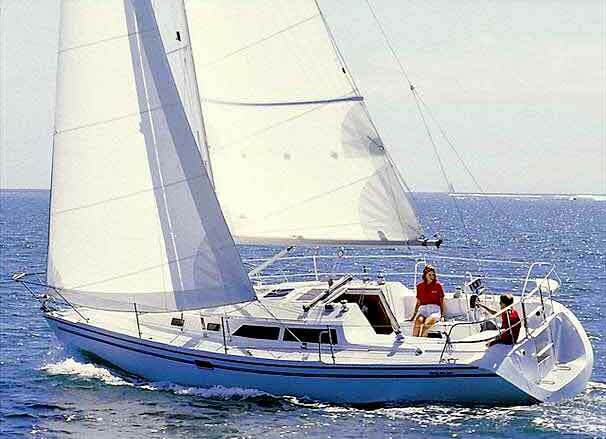 I was very impressed by the quality, the standard equipment, and the sailing ability. Sail Area 534 sq. ft.